Parking: The largest and probably most useful car park for this section of coast is at Ouaisne. It is free parking all year and doesn’t get quite as busy as those in St Brelade’s. At Belcroute there is free parking on the slip, this is a perfect place to launch when there are strong winds blowing, particularly from the west. Parking in St Aubin’s is difficult and it’s not an ideal place to launch from so is probably best avoided. Refreshments: At Ouaisne there is a popular pub “The Smugglers”, good food and beer with a warm fire in the winter. Perfect during the colder months. In Ouaisne car park there is a small cafe, with outside seating. It’s opening times have always been slightly temperamental but the current owners are opening on a much more regular basis, from spring to autumn. The cafe serves a lovely variety of food. There is a range of pubs, cafes and restaurants in St Aubin’s and it makes a nice break in a paddle to land in the harbour for a quick drink or bite to eat. If you fancy breaking your paddle there is a Pizza Restaurant on the beach at Portelet. 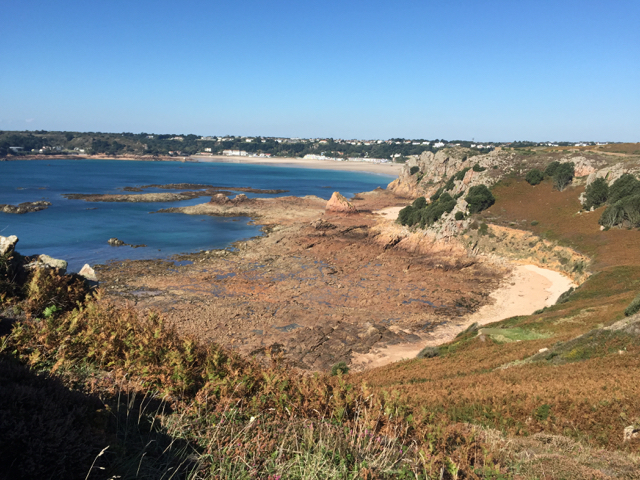 Although this section of the coast is described as being from St Brelade’s to St Aubin’s it is probably easier to depart from Ouaisne. 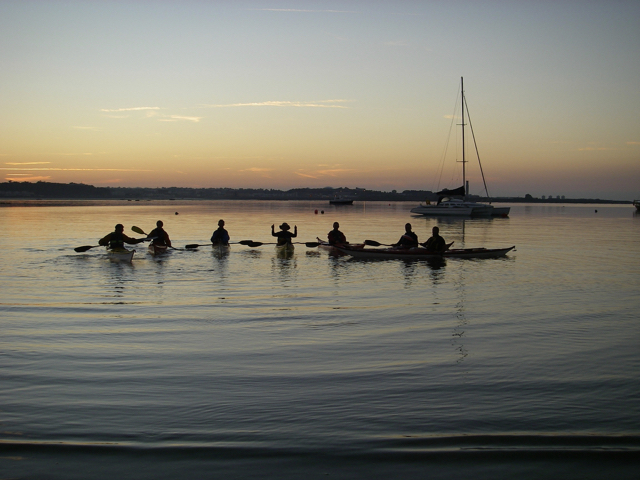 Ouaisne is one of those beaches where it is easy to launch or a real pain. If the tide is in it is an easy carry whilst at low water on a spring tide it is pretty much at the limit of what is an acceptable carry. You will need several breaks walking down the beach and it is one of the beaches where a trolley would be really useful. 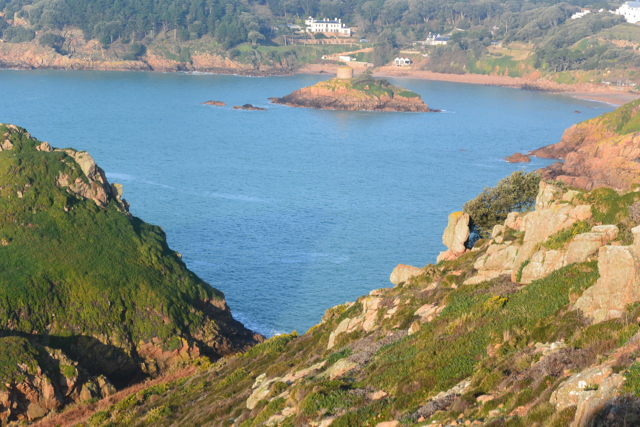 Leave the beach and turn south towards the cliffs, once around the first headland, the physical feature La Cotte de St Brelade’s, comes into view, almost immediately. This is one of the most important Neanderthal sites, not just in Jersey but in Europe. Thousands of Neanderthal items have been discovered in the deposits at the rear of the obvious cleft. the exact location is easier to identify at the moment because of the black material, which is being used to protect the deposits. It is likely that when people were living in this area the sea had retreated to the west, so the inhabitants would have been looking out over plains. 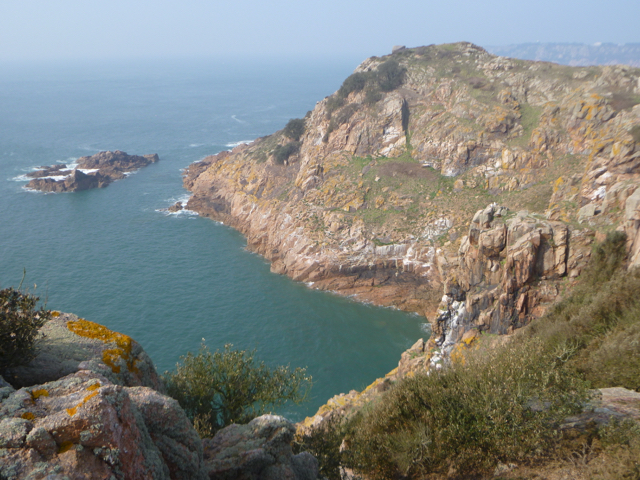 There are a number of quite difficult rock climbs on the cliff faces in the area, whilst La Cotte Island provides shorter climbs, which are probably more accessible to the average climber. If there is a large swell running there are a number of reef breaks, which require caution but the main focus for your attention should be Point Le Fret. 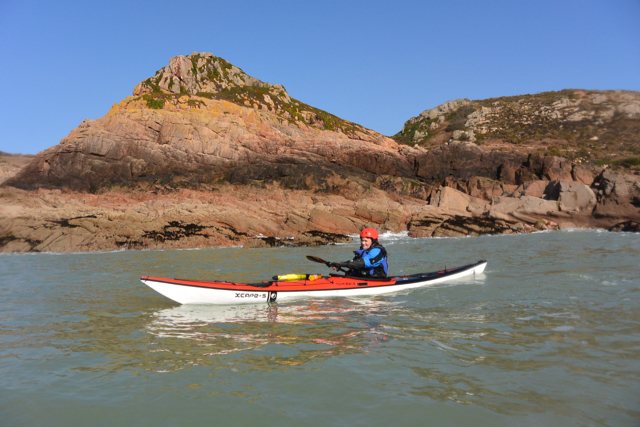 Point Le Fret is one of the wildest headlands in Jersey and the hazards, which it presents, are often underestimated by paddlers. On a spring tide fast moving tidal streams occur quite close to the rocks and it is also exposed to any westerly swell, which is present. 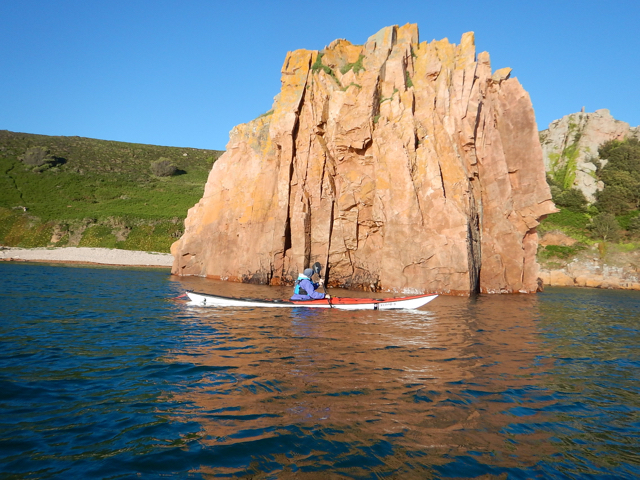 Whilst paddling towards the headland monitor the conditions and if necessary take a wider route around the point. Heading east around the headland the heavily defended Noirmont Point comes into view, on the far side of Portelet Bay. 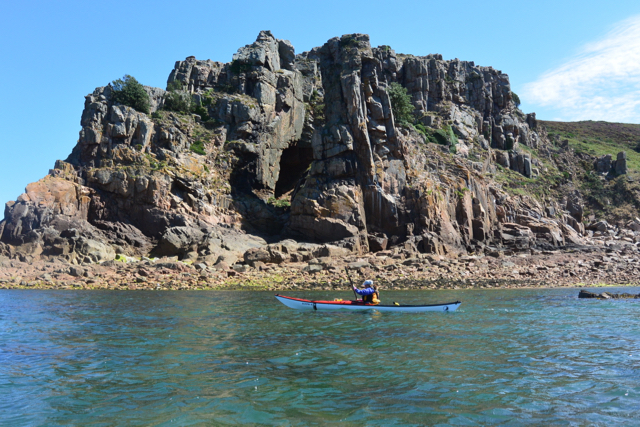 Before reaching Portelet there is a steep section of coast with a cave, which is worth exploring. Above there is a steep cliff, which has a number of rock climbs on. On a warm summers day the reds of the granite, the blue of the sea and the varieties of flowers combine to produce a scene, which is almost Mediterranean in, feel. The colours and light interact to produce a setting, which is almost unique in Jersey. 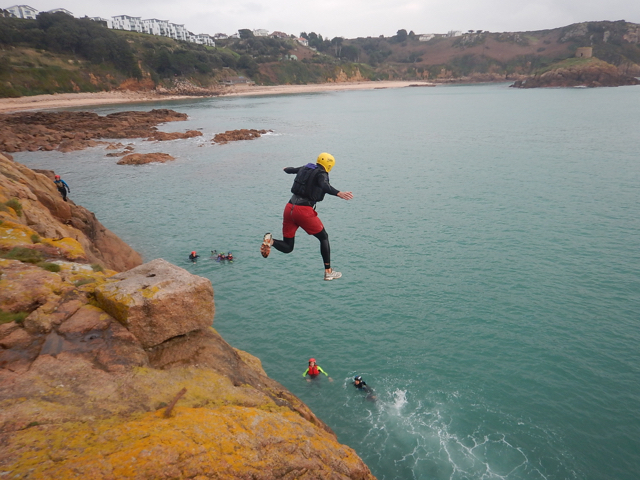 Along the base of the cliffs there is an excellent coasteering route, which runs from Portelet to Pt Le Fret, there are a number of excellent jumps, all of which can be avoided, a couple of swims, a cave and some great scrambling on solid granite. 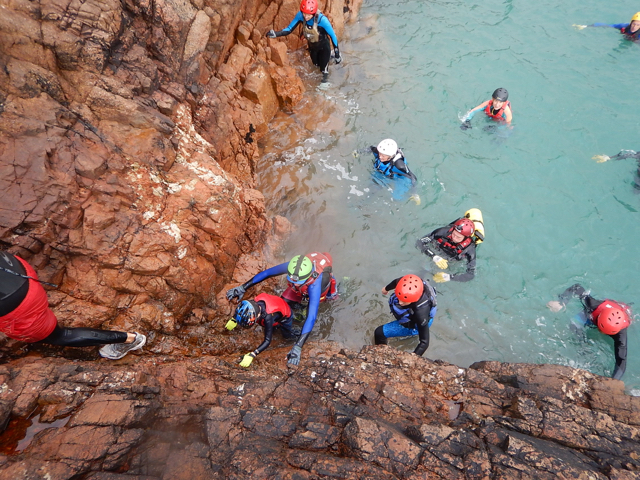 All the ingredients that are required for a great couple of hours coasteering. Portelet is a pretty bay whose beauty was somewhat tarnished by the presence of a holiday camp which became far more obvious after the storm of 1987, which destroyed a large number of trees. The camp was demolished in 2007 and for a couple of years the bay regained some of its former glory but it has once again been transformed, as the inevitable apartment blocks have emerged from the hillside. 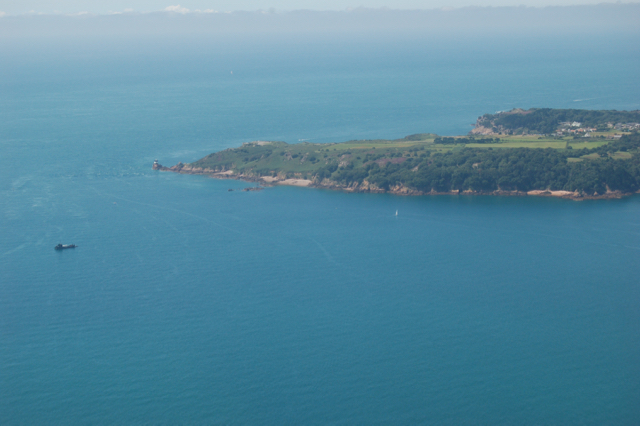 In the middle of the bay is Ile au Guerdain, a small rocky island with a tower on the top which was built in 1808. It is often mistakenly called Janvrin’s Tomb, after Philippe Janvrin, a Jersey sea captain who died of the plague in 1721. His body wasn’t allowed to be brought ashore so his wife built a tomb on the small island in Portelet Bay, where he was buried on the 27th September 1721. The tomb was probably destroyed when the present tower was built. The sandy beach is a pleasant lunch stop and during the summer months there is a pizza restaurant close to the beach. It is very popular so it is best to book in advance. 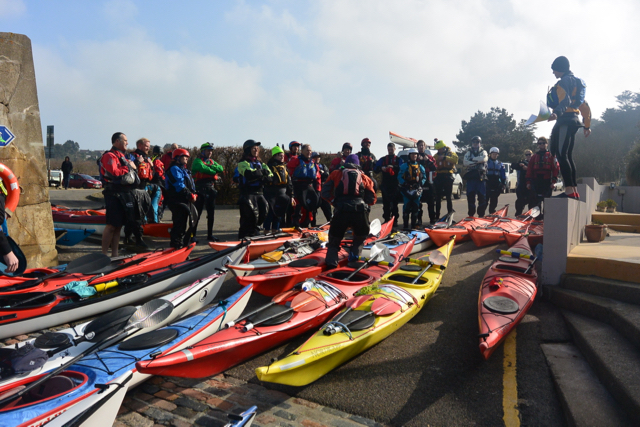 At other times of the year the paddler wishing to purchase refreshments will have to scale the steps to the pub on the cliff top, so it is probably better to travel prepared with food and drink. 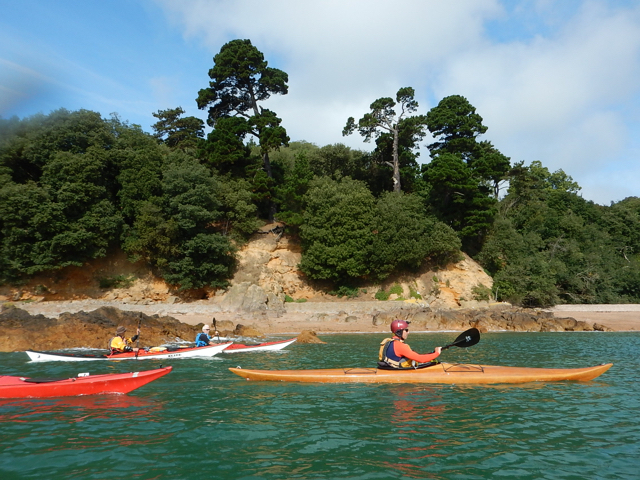 These same steps prevent Portelet being used as a launching spot for any paddling excursions. The western side of the bay under Noirmont headland is a paradise for the person interested in physical geography. There are blowholes, faults, dykes, caves, arches and stacks all present in a small area. Ile Percee is the large weathered stack just to the west of the headland, which has been split by an arch. At high water on larger tides it is possible to cut through the gaps between Ile Percee and the headland but at all other times it is necessary to paddle around the outside. 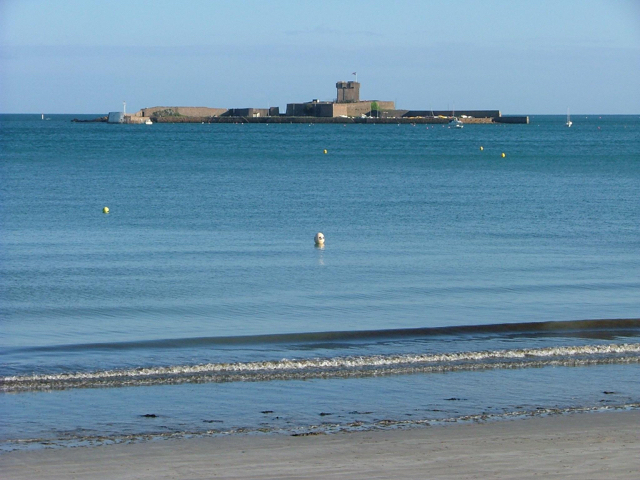 Noirmont is the last headland before St Helier comes into view. Several German bunkers look out from the summit whilst at the base defenses of an earlier age are present. The black and white round tower was built during Napoleonic times. Just offshore is Les Fours buoy, a north cardinal mark. Take care in this area as all the shipping passes between the headland and the buoy. A fairly narrow passage which doesn’t leave a lot of room for vessels to manoeuvre around stray kayakers. A large tidal race develops off this headland, particularly to the east, which provides an interesting play spot for the more experienced paddler. The waters between Noirmont and Belcroute are interesting because the tidal streams flow south for about 9 hours out of every 12 and only head north for 3 hours. This tidal anomaly catches some unwary kayakers out each year. Rounding Noirmont, St Helier now dominates with Fort Regent and the chimney at La Collette towering over the harbour and Elizabeth Castle. 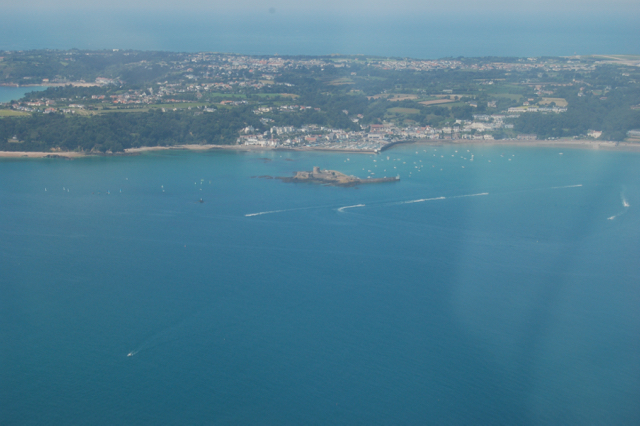 To the north is the broad sweep of St Aubins Bay, which is largely built up and very popular with other water users. In the north west corner is St Aubins Fort, built in 1542, which is now used by the Education Department as an Outdoor Education Centre. 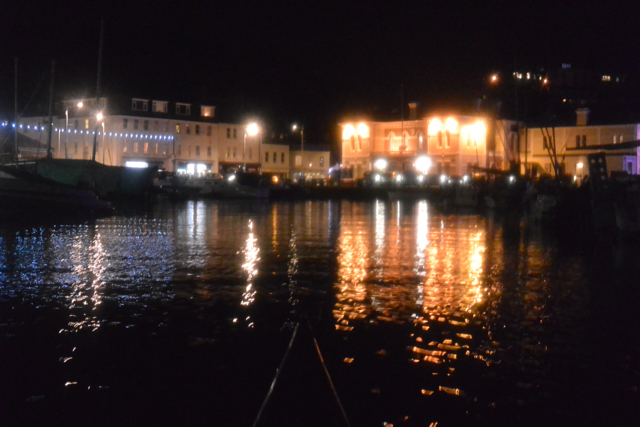 St Aubins Harbour and its environs make a pleasant evening paddle especially on Spring tides. The stretch of coast running south from St Aubins past Belcroute as far as Noirmont is unusual in Jersey in that in several places the trees reach right down to the waters edge. The slip at Belcroute is a useful place to launch particularly during strong winds from the west as it offers reasonable shelter. It is also a perfect place for practicing night navigation as there are numerous navigation marks in the area, which provide excellent targets to aim for. 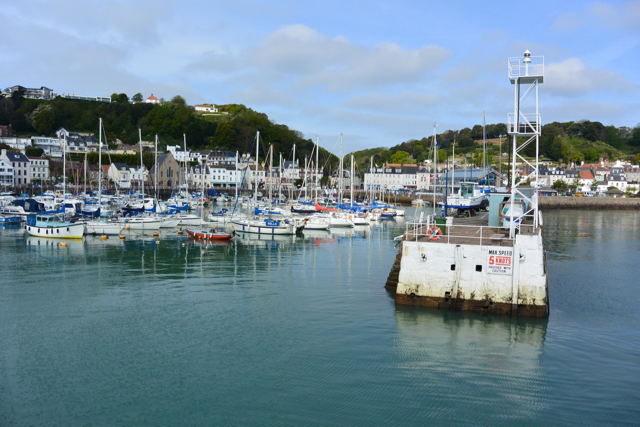 St Aubins itself is usually too busy to contemplate as a launching spot but there are several useful car parks in St Aubins Bay, for example close to La Haule, where access to the water is relatively easy as long as low water springs isn’t chosen. 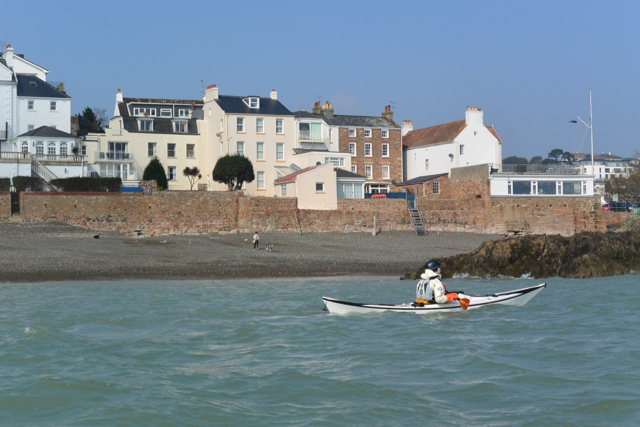 If you have come prepared there are a number of cafes and pubs in St Aubin’s, which can offer refreshments to the visiting kayaker. Slack water occurs round about high and low tide. Be aware that to the east of Noirmont the tidal streams run parallel to the coast, flowing south for 9 hours and north for 3 hours. 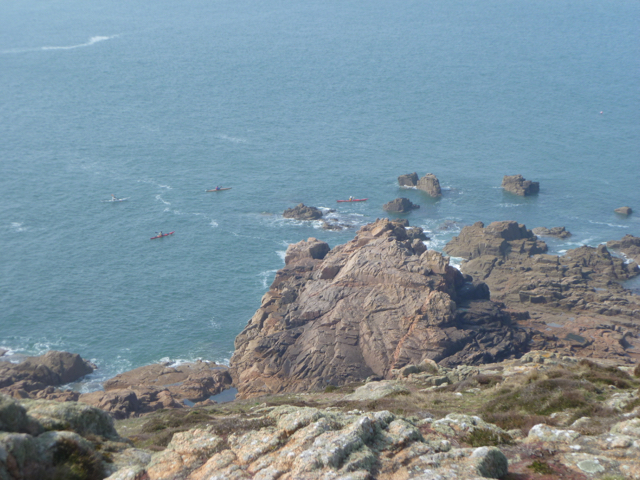 A significant tide race develops off Noirmont with wind against tide, particularly an ebbing tide and a westerly wind. 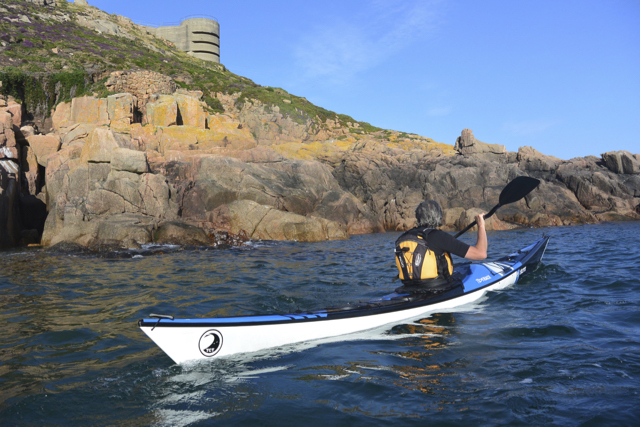 There is a great tide race for playing on when sea kayaking, just to the north east of Noirmont. It starts to work best just after high water. It is probably my favourite race to play on.